Thor #29 (Nov 2000, Marvel) VF/NM Signed by Artist Scott Hanna! AVENGERS INFINITY #1 THOR * QUASAR * TIGRA MARVEL 2000 NICE!!! Deadpool #37 (Feb 2000, Marvel) NM (9.4) "Special Guest: Thor" !!!!! 5 product ratings - Deadpool #37 (Feb 2000, Marvel) NM (9.4) "Special Guest: Thor" !!!!! 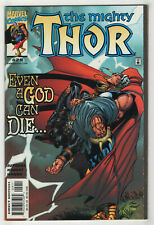 CALL HIM THOR #1 ONE-SHOT MARVEL 2000 NICE!! !